The STUC is organising a mass demonstration on 20th October in Glasgow. 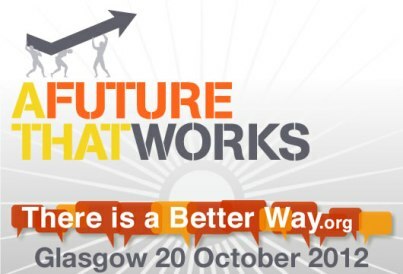 The event will coincide with a similar event in London under the banner ‘A future that works’. The Coalition Government may be in crisis but they are still refusing to change course from their dangerous and damaging programme of cuts and austerity. On the morning of Saturday 20th October, trade unionists and community activists from across Scotland will gather for a march through Glasgow to play our part in telling the Government that enough is enough. In the coming weeks you can come to this site to download publicity materials, find out about transport, or volunteer to help on the day. Support for the STUC’s October 20th 'A Future that Works' Demo in Glasgow is building up. The march gives us all- young, old, black, white, students, workers, unemployed, and with disabilities - a chance to fight back against the government’s programme of cuts and austerity. Come to the Mobilising Rally on Wednesday Oct 3rd. Let us unite our different struggles and build a mass protest on October 20th! To mark the 10th anniversary of the major 2 million strong demo against the Iraq war, which took place on 15 February 2003 we are holding a conference in London which will discuss the aftermath of the war and the threats of war in the present and future. It will be in Friends House, London on Saturday 9th February 2013. A wide range of prominent speakers have already been booked. Brochures and more details to follow soon.